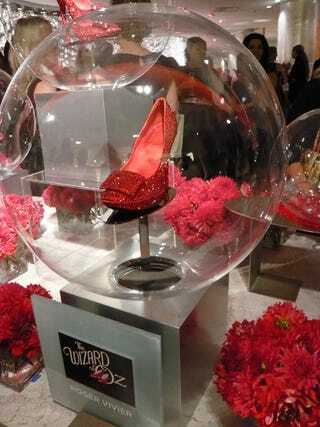 Fashion week officially starts today, but it kicked off last night with an event at Saks: To celebrate the 70th anniversary of The Wizard of Oz, various designers created Swarovksi-crystal encrusted shoes inspired by the Ruby Slippers. The heels are on display in the windows and on the shoe floor in the store; later they'll be auctioned off to benefit the Elizabeth Glaser Pediatric AIDS Foundation. But on to the party! There were lots and lots of shoes, of course. A "yellow brick" carpet. Many Project Runway alums, Nigel Barker and Dorothy Gale herself, after the jump. While waiting outside, this Dorothy walked around and checked out the crowd. You forget how much of fashion week is just spent waiting in line. It's like an amusement park. After half an hour I forgot what I was waiting for. At least I was in the shadow of Rockefeller Center and St. Patrick's Cathedral. There were Ruby Slippers on the sign in the elevator! Once inside, I was mesmerized by the shoes. The special Ruby Slippers were all under glass. You can see the "yellow brick carpet" here. Okay so, on to the partying. So weird to be drinking around shoes. Expensive designer shoes. Gucci, Louboutin, Dior. But! It's all about the celebs, right? Josh Radnor plays Ted on How I Met Your Mother. When I realized that this picture had no flash, I asked him if I could take another. That's when the mini burgers went by. So when I did get a better shot, he was gleefully holding a mini burger. Josh was there "with" Lindsay Price from Lipstick Jungle. I say "with" because it was less like a date and more like she was the only person he knew there or they had the same publicist or something. This is Paige Davis from Trading Spaces. I forget why we were so psyched. Next I saw ProjRun alum Santino Rice, who insisted on taking this picture himself and declared it "sweet." Another ProjRun alum: Kevin Christiana. He questioned whether he should be holding the crabcake in the photo but I said it was fine. Again, from ProjRun: Jack Mackenroth. It was really hard to get close to Nigel Barker. He was swarmed, then a whole bunch of young kids wanted their pictures taken with him. I think he thought I was with the kids. Anyway. My pic of him turned out crappy. Eventually, something was telling me "There's no place like home."